This may come as a surprise, but the Atlanta Hawks are actually closer to becoming championship contenders than you might think. This summer, Atlanta has a realistic opportunity to present LeBron James and Carmelo Anthony with the most attractive free agent pitch of any team in the league, if Danny Ferry maneuvers contracts aggressively and appropriately. It’s certainly an ambitious idea, but it’s far from ridiculous. First and most obviously, the Hawks are situated in the Eastern Conference. This gives them a succinct advantage in their pursuit for James over half of the league. In the East, a LeBron-led team is guaranteed deep playoff success. Why leave the Eastern Conference for the treacherous West when there’s no need to? Secondly, and most importantly, the Hawks are one of only a few teams that can create enough cap space to offer max contracts to both James and Anthony. The two superstars have mutual interest in playing together, meaning the Hawks’ cap flexibility gives them a unique recruiting pitch that could force James and Anthony to think long and hard about a future in Atlanta. Cleveland, the only other contender with the flexibility to unite James and Anthony together, is filled with flaws starting from the top down. James likely has still not forgiven Cavaliers owner Dan Gilbert for his public defamation of The Decision in 2010. Moreover, with long-term money already committed to Jarrett Jack, it would be easier said than done for Cleveland to create enough cap space for two max contracts. Toss in the fact that Carmelo Anthony has already said publicly that market size and location will play a role in his free agency decision, and it just doesn’t appear likely that he will ever take Cleveland’s candidacy seriously. The Lakers, meanwhile, have been plotting to combine the two stars as well. However, with Kobe Bryant making $23.5 million and Steve Nash on the books for next season, squeezing James and Anthony onto that roster would be impossible unless they were willing to sign for well less than the max. Which brings us to Atlanta. The roster, when healthy, is already a top five team in the East. Before Al Horford went down to a pectoral injury halfway through the season, the Hawks were sitting comfortably as the No. 3 seed in the conference. Atlanta has the unique combination of a foundation in place with unparalleled flexibility on the trade market. Take a look at their roster; their absolute worst contract is Lou Williams’ expiring mid-level exception. For most teams, Lou Williams on a one-year deal at the midlevel is actually a pretty decent contract. For Atlanta, it’s the lone smear on Ferry’s flawless acquisition streak to date. Ferry has a longstanding relationship with James from their days in Cleveland and can finally promise the King a worthy supporting cast. Let’s assume the Hawks maintain their roster from this past season, decline qualifying offers on Shelvin Mack and Mike Scott, and take on both Lucas Nogueira – their first round pick from last year who’s been maturing in Europe – and their first round pick from this year (slotted at 15). That would put the Hawks total payroll $51,731,058 for next season. The NBA’s salary cap is expected to expand from $58.6 million to $63.2 million for 2014-2015. This gives the Hawks approximately $11.5 million to spend liberally on the open market. That’s not bad, but also not nearly enough to sign one max contract – let alone two. Atlanta knows this. Ferry also knows that teams would be lining up to acquire valuable assets from the Hawks should they choose to sell low in an effort to create necessary cap space. The top priority for Atlanta would be to find a suitor for their starting point guard. Jeff Teague – a fringe All-Star caliber point guard in the East – is making a reasonable $24 million over the next three seasons. And while he’s on a good deal, that money needs to be cleared if Atlanta wants to chase LeBron. Teague is still only 26 years old and averaged 16.5 points and 6.7 assists last season. He’s a desirable asset for any team in pursuit of a point guard. As for the teams that would be interested in Teague, Orlando comes to mind immediately. They have two lottery picks and an obvious need for a point guard. If Teague were to be traded for the 12th overall pick (the lesser of Orlando’s two), I don’t think anyone around the league would complain for either side. Orlando is fairly capped out so let’s say for the sake of convenience that the trade includes a third team to take on Arron Afflalo’s $7.5 million for next season. We’ll use the Celtics in this case with Boston reimbursing Orlando with the 17th overall pick. As a result, Atlanta would be clearing $8 million in cap space for next season and would come back with a valuable lottery pick. Orlando would simultaneously correct their awkward backcourt, bring in a proven point guard, and maintain a second first round pick in the teens. Sounds like a win-win. As for Boston’s motives, Danny Ainge has always been opportunistic. To add a top-10 shooting guard on a fair deal without forfeiting anything more than the 17th pick is a major steal. Without Teague on the roster, Atlanta would have just enough money to offer one max contract this summer. That’s not going to be enough. 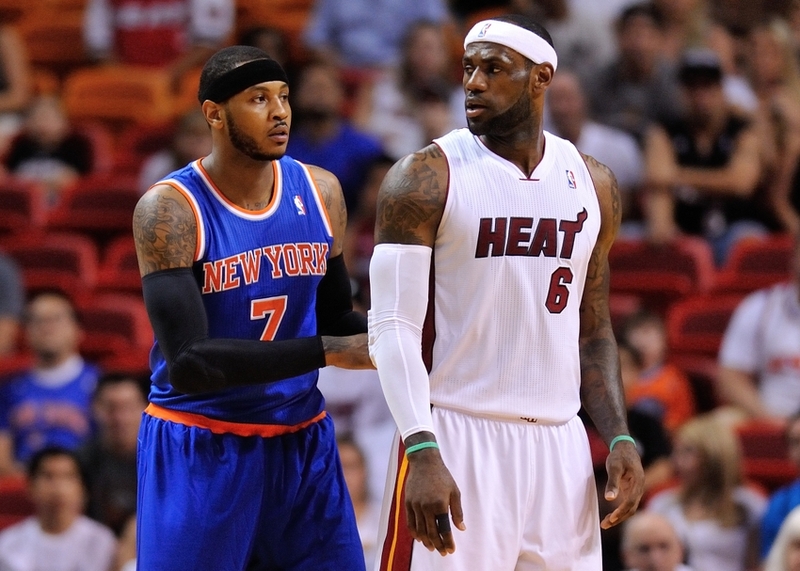 The only way LeBron James is going to Atlanta is if Anthony is coming with. Luckily, Atlanta has plenty more to flexibility to work with. 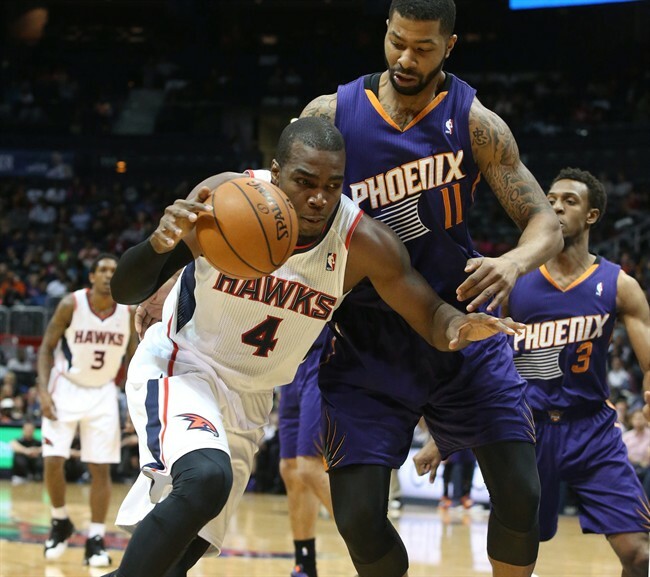 The next big contract to move is Paul Millsap. Widely heralded as one of the league’s most underrated players, Millsap was an All-Star last season and continues to emerge as breakout stretch forward. He’s on an extremely friendly contract for next season at only $9.5 million. As suitors for Millsap go, the Suns would be an extremely logical destination. Phoenix wants to add an All-Star big man and has three picks in this year’s draft. With Channing Frye opting out of his contract for free agency, the Suns have an immediate void in their starting lineup for a stretch shooter. Millsap shot 36% from deep last season (with an absurd 43% from deep on the road) and provides strong interior defense – not to mention top-tier rebounding. All three of those roles are areas of need for Phoenix. Let’s assume Phoen ix is willing to trade their 14th overall pick and one of their future first round picks (they’ll have three in the next draft) to Atlanta in exchange for Millsap and Jon Jenkins. That would leave the Hawks after both trades with the 12th, 14th and 15th picks in this year’s draft and would save them approximately $18.8 million in cap space by clearing Teague, Millsap and Jenkins’ contracts. Combine the $18.8 million with the $11.5 they already have available and we’re looking at $30.3 million available – closer to having enough money for two max contracts. But Atlanta wouldn’t be set just yet. Remember, each first-round pick in the teens has a cap hold of just about $1.5 million in the rookie season. Three of those rookies would eat about $4.5 million of the $18.8 million they created. Of course, knowing the Hawks’ style, at least one of those picks would be a draft-and-stash player from Europe like Dario Saric, Clint Capela, or Jusuf Nurkic. In this case, those players wouldn’t count against the cap space created. Let’s say two of the picks are used on players in the United States and one is stashed. Atlanta would then sit with roughly $30 million available. Ferry might then be keen to use a pick as a vehicle to clear himself from Lou Williams’ expiring contract – thus creating an additional $5.45 million to add to the $30 million. Charlotte could use another scorer off the bench and has the cap room to take on Williams’ contract. If Atlanta included a future lottery protected pick, I think the Hornets would bite. That leaves Atlanta with $35 million available. The Hawks would still sit several million dollars short from being able to offer James and Anthony the absolute max contracts. Between Kyle Korver’s $6.25 million for next season or DeMarre Carroll’s $2.44 million, creating the space wouldn’t be difficult. However, I’d imagine James and Anthony might relent on the idea of earning the absolute maximum if it meant they could play alongside the best shooter in the NBA in Korver. In this case, let’s say Carroll’s contract is the one Atlanta decides to trade for a second-round pick to create a bit more cap room. That would give Atlanta just over $37 million to offer James and Anthony combined. The biggest difference between this Hawks team and the 2010-2011 Heat would be that this roster’s foundation would already be in place. Beyond James and Anthony, Atlanta would have Horford, Korver, Dennis Schroder, Pero Antic, Lucas Nogueira and three first round picks to fill out their rotation. That’s ten players right there with potential to start either now or down the road. If all three first-round picks were 22 years old or younger, the average age of this Hawks team would be 26 years old. Compared to the 2010-2011 Heat’s average age of 31, these Hawks would have a much wider title window. And with a bevy of veterans that would surely be lining up to ride James’ coattails toward a championship (Ray Allen perhaps? ), Atlanta would have to be considered the favorites to win the championship as soon next season. Best of all, Atlanta would still have Boston’s first round pick for next season (acquired in the Joe Johnson deal) and whichever future pick they get from Phoenix in the Millsap trade. That would be a dynasty in the making.